The super cool store I’m Your Present sponsored me this panda collar clip to review. It’s such a cute and unique idea! I’ve never seen a collar clip before, so I was excited to review this item. I hope you all love it as much as I do! There were no rips or tears in the bag. The packaging was very secure, and nothing was damaged. Everything in the package was wrapped in pink tissue paper! 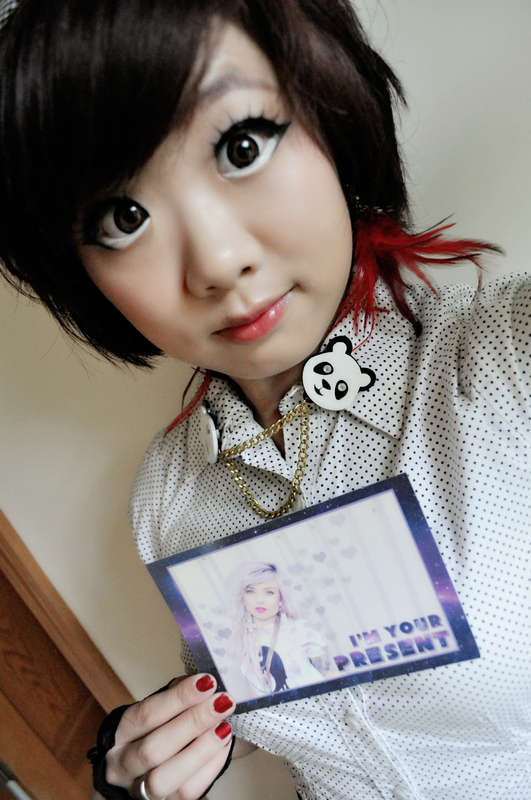 Inside the tissue paper was a box (with the panda collar clip inside), a business card (postcard-sized), candy, and cute bobby pins! The bobby pins and the candy were pleasant surprises since Kelly, the designer for I’m Your Present, told me she would send me the panda clips. I had no idea there would be extra goodies in the sponsored package! The panda collar clip were safe and sound nestled inside their box! I checked the item, and there are no flaws or damages. I am happy with these adorable clips! They are very high-quality; not flimsy or cheap at all. The clips hold onto my shirt collar without slipping. The panda design is crisp and clean. There is a layer of laser-cut white over a layer of laser-cut black for the design, which adds depth to the piece. The gem-stone panda eyes are a lovely touch! This collar clip can be worn on a variety of occasions; you can wear it casually, or you work it into a more formal coordinate. If the shirt has a collar, you can clip it on! The gold chains are securely attached to the panda clips, secured through a small hole at the bottom of each clip. The back of each panda piece has a gold clip glued on. Out of curiosity, I tried to use this panda collar clip as a hair clip. I love hair accessories… and you know what? It works well as a hair clip too! It didn’t pull on my hair and was comfortable to wear. It clips onto my hair as securely as it clips onto my shirt collar. 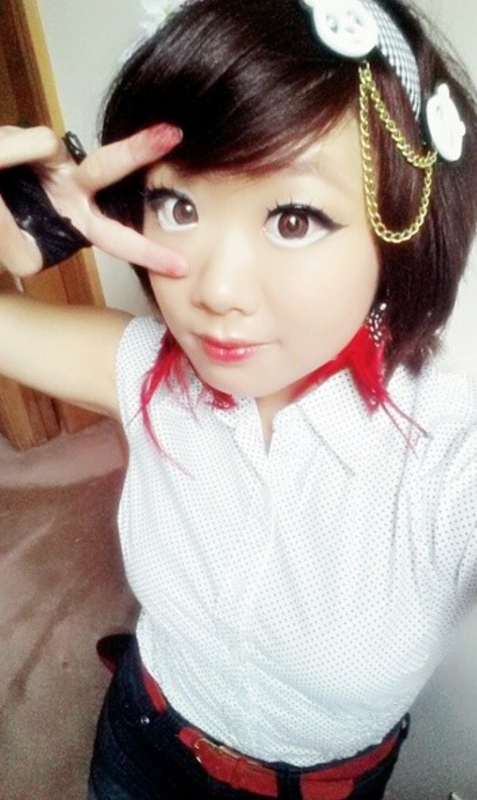 ^_^ So if you don’t wear collared shirts, you can still use this cute accessory. If you want this clip for yourself, you can buy it for $12.00 at I’m Your Present’s Etsy store! Check out I’m Your Present’s other stuff as well. They have so many cute and cool items! From adorable sweaters to fabulous earrings, I am sure you will find something you love from I’m Your Present. 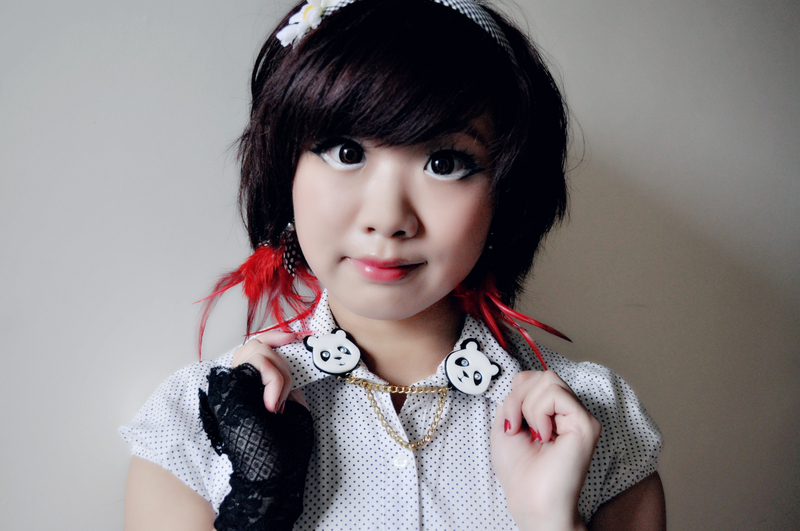 You can check out more photos of the panda collar clip in this album on my Facebook page, Alice in Lolitaland.